A Greenfield man accused in several criminal cases with drug- and theft-related crimes was sentenced Monday to nearly nine years in prison for burglary, grand theft and receiving stolen property, agreeing to testify against his co-defendants at upcoming jury trials. 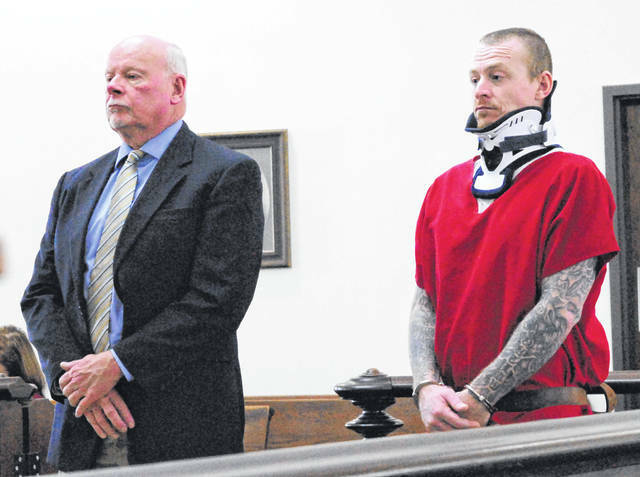 Terry Hester, 34, Greenfield, appeared in Highland County Common Pleas Court Monday afternoon wearing a neck brace, and after arguing with the judge over the cause of his injury, he was sentenced to eight years and 10.5 months in prison. Coss accused Hester of trying to get out of jail on medical furlough so he could escape custody, which the judge said Hester had done before. Attorney Bill Armintrout, representing Hester, said his client had previously been released on medical furlough and never reported back to jail because he was addicted to drugs and needed a fix. Coss sentenced Hester to nearly two more years in prison than a joint recommendation from prosecution and defense included in Hester’s plea deal. As part of the deal, Hester will testify for the state against Tyler Trent, 30, who is his co-defendant in two cases. Trent last Wednesday pled guilty in three of his five criminal cases and now faces up to five years in prison. Trent pled guilty to two separate counts of aggravated possession of methamphetamine and one count of receiving stolen property. Hester on Monday pled guilty to burglary and grand theft in a case filed against him, along with Trent, Taylor Jenkins, 23, and Brandon Greene, 32. In that case, Hester, Trent and Jenkins are accused of breaking into Dave Fairley’s barn dwelling in Highland County and taking items worth more than $1,000. Hester, Trent and Jenkins were charged in that case with two counts of burglary, one count of breaking and entering, one count of theft and one count of grand theft. Greene is charged in that case with receiving stolen property. The indictment says Trent, Hester and Jenkins broke into an apartment in a barn owned by Fairley and stole a .22 revolver, a Bible, $150 in one dollar bills, a flashlight, four rings, John Deere pocket watches, a BB/pellet gun, DVDs, two Verizon tablets, a laptop, a 4-H knife and a black bathroom kit, among other items. The defendants were identified by the car they drove during the theft, which was caught on surveillance footage, according to court documents. Since Fairley, the victim, is Highland County Prosecuting Attorney Anneka Collins’ father, Chad Randolph of the Clinton County Prosecutor’s Office was appointed as a special prosecutor on that case. Randolph is also a special prosecutor in a receiving stolen property case against Trent, which is still pending. Jenkins pled guilty last Wednesday to burglary and theft in the Fairley case, and will testify against her co-defendants if they go to trial. She faces more than two years in prison. The other charges against her in the Fairley case indictment were dismissed as part of the plea agreement. Charges of attempted burglary, tampering with evidence and possession of drugs will be dismissed against Hester as part of his plea deal. Greene rejected a plea offer last week for his receiving stolen property charge and his trial was continued until after his co-defendants’ cases are resolved so they can testify on his behalf. He also awaits further hearings for a probation violation in a separate case.